Making hot chocolate with real cocoa is not only delicious, but it is actually a healthier alternative to using syrup or processed chocolate. 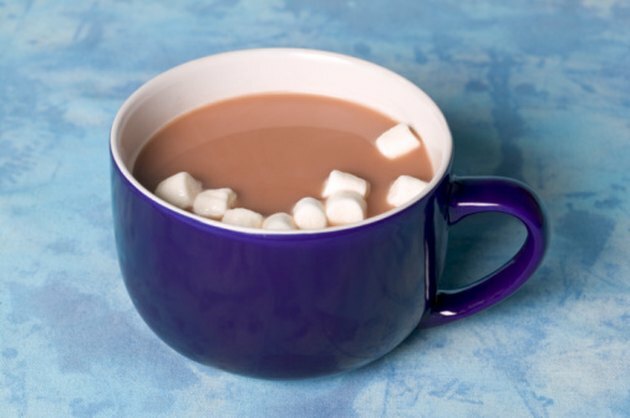 Though there is a technical difference between hot chocolate and hot cocoa, the latter being free of added fats and sugars in the chocolate, the term hot chocolate is used most often to represent both drinks. Another benefit of cocoa is that it contains antioxidants, which counteract the harmful effect of free radicals. Making hot chocolate with fresh cocoa takes just a few minutes. Place 12 to16 oz. of milk into a small or medium pot. Regular milk will make for a richer tasting cup of hot chocolate, as well as provide nutrients like calcium, vitamin D and potassium, but soy milk may also be used. Heat the milk on the stove over medium heat. Be sure to keep a close eye on the pot, since milk can easily burn. Occasionally stir the milk as it is heating up and remove it from heat right before it begins to boil. Spoon 3 to 5 tbsp. of cocoa into the milk after you remove it from the heat. Continue to stir the cocoa and milk until all of the chocolate powder is absorbed. You may use a wire whisk as an alternative to a spoon, which can help to mix the powder into the milk. Add 2 tbsp. of white or raw sugar to the hot cocoa and stir. Use more or less sugar depending on your particular tastes. You may also use a sugar substitute if you prefer; one packet of sugar substitute equals one to three tablespoons of white sugar, depending on the particular sweetener that you use. Add a pinch of any additional spices that you like, such as cinnamon, nutmeg or cardamom. Pour the hot chocolate into a large mug. Drink as is or top with whip cream or mini marshmallows. Mayo Clinic; Can Chocolate be Good For My Health? ; Katherine Zeratsky, R.D., L.D.